Osborne/McGraw-Hill has just released the first title in a new series of Assembly Language Subroutines. 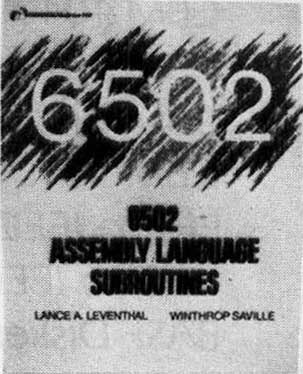 6502 Assembly Language Subroutines by Lance A. Leventhal and Winthrop Saville presents an overview of assembly language programming for the 6502 microprocessor and a collection of more than forty useful subroutines. These routines can be used as subroutines in actual applications and as guidelines for complex programs. Leventhal and Saville provide code for common routines including: code conversion, array manipulation, arithmetic, bit manipulation, summation, sorting and searching. Also included are examples of I/O routines, interrupt service routines, and initialization routines for common family chips such as parallel and serial interfaces, and timers. These subroutines can run on microcomputers manufactured by Apple, Commodore, Ohio Scientific, Atari, and on other 6502-based micros. This book, as well as forthcoming books in the series, is aimed at the user who wishes to utilize assembly language immediately. All routines have been debugged, tested and documented.